Nordstrom has an awesome Big & Tall category on their page, but you can also find many pieces that are only tall. They have business and casual shirts, nice tall tees, polos, long jeans and pants, shorts and more. Asos has a great series called Longline and Super Longline – and now ALSO a dedicated Tall line. Longline items are longer in torso length, so they’ll fit tall slim guys. Sleeves aren’t that much longer on the Longline clothes, so look for t-shirts, sleeveless shirts and stuff like that first. Jeans are available in inseam up to 38″. American Tall is dedicated to tall and slim men from 6’3″ to 7’1″ – and thank you for that! 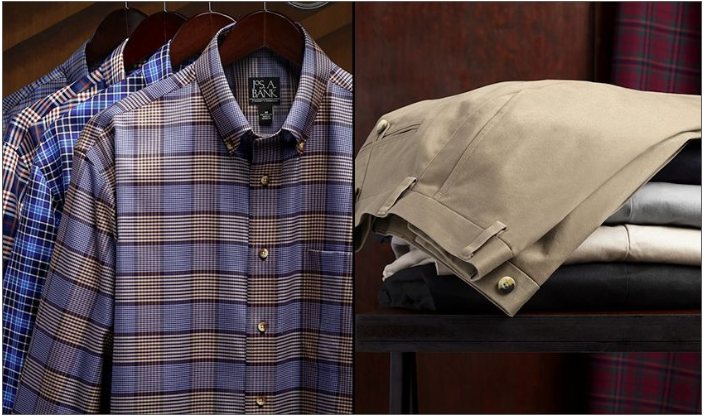 Great shirts with long sleeves, pants for tall guys up to 38 inseam and much more to come. American Tall is based in Canada and ships worldwide at very reasonable prices. Go check out their awesome pieces here. See my meeting with American Tall. TailorStore offers shirts, chinos, jackets and more for tall people looking for the perfect fit. My personal favorite shirt is from TailorStore, and the shirt is tailored exactly after my own measurements. Once you try this concept, you will never settle for a baggy shirts again. ✅ ‘tallsome15’ at checkout gives 15% off for 1 custom tailored shirt. Ships to: Germany, UK, Australia, US, France, Austria and rest of Europe. 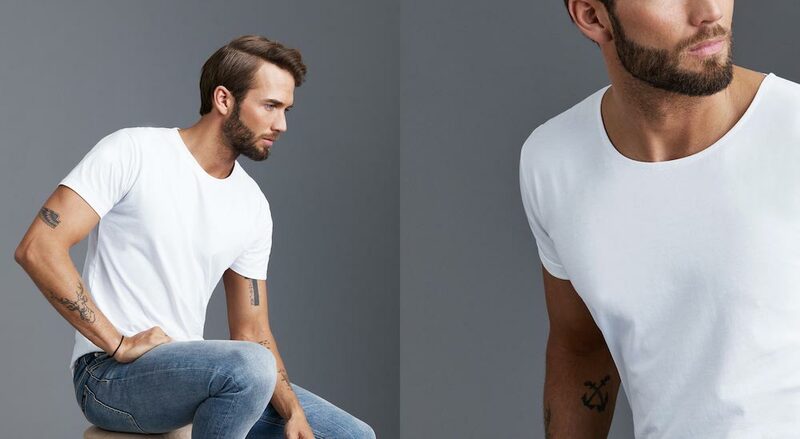 Tailor-made t-shirts; PERFECT for whatever body type you have. Tall and skinny, Big and tall – Son of a Tailor is made to measure – take the size quiz and get your new favorite t-shirt shipped for free to your doorstep. Read my review of Son of a Tailor, or just go ahead and take a look at their site here. ✅ ‘TALLSOME’ at checkout gives 15% off. G-star Raw offers jeans for tall men in 38″ inseam. What’s great about G-star is that their tall jeans are fitted and stylish in their design – no dad-jeans here. The quality of G-star is always very good, which you’ll notice as soon as you get to feel the thick quality of the fabric. If you like the brand and the fit, you’ve got yourself a great option of fitted jeans for tall men right here. See full Jeans for Tall Men List. Get 15% OFF – Use ‘Tallsome’ at checkout. A Swedish clothing brand for tall men established in 2013. They just got their own button-down shirts in – and I think they look awesome! Mattias who started it is 6’11, so he knows of the struggle. Besides shirts, you can shop tall tees, singlets and more – check it out! See full Dress Shirts for Tall List. VIDEO REVIEW // Super great basic t-shirts for tall, slim guys like me. I own 3 of them, and I love them – great fit, smooth feel and a really good price as well ($20). I’m 6’8″, 230 pounds, and the XL is a perfect fit for me. Get your new favorite basics here! Ships to: All Countries (except Kenya, Palestine, North Korea and Nepal). Gap’s selection for the tall man. Many tall sized items in contemporary styling, including loads of pants with 36” inseams – a go to place for chinos. Very swift service and free shipping on orders above 50 EUR. They also have a Slim Shop with shirts, jeans and khakis for tall slim men. Looking for large shoes in size 12 to 19? Walktall sells a handsome range of formal and casual footwear in hard-to-find larger sizes for tall men. Walktall offers a diverse range of footwear, in sizes 12-19, from all the big brands. The company also designs and makes its own upmarket range, plus a great selection of large size socks. See full Tall Men’s Shoes List. What a great webshop! They have Tall Shirts with longer sleeves and torso, but that is not the best thing. What I love the most about Bonobos is that they have a great selection of Chinos in 36″ inseam. I want to link directly to the chinos – go have look! London based tailor who also sells online. They have great Clearance-prices and many shirts are customizable regarding cuffs, pockets and monograms. For some shirts you can customize sleeve length. And they have a ‘virtual fitting room, where you give your measurements, and you can literally see how the shirt would fit your body. See full Dress Shirts for Tall List. A UK based store for tall guys with international delivery. They are getting a better and better range of clothing with lots of hoodies, jeans and chinos. Also they are really good in shoes for big guys – go have a look. Or – see full Dress Shirts for Tall List. A great selection of shoes for tall men – with big feet. If you have large feet, then you are probably looking for something above size 10 – and Eastbay is the place to go for these bigger shoe sizes. Eastbay has big shoes up to size US 18/ EU 55, and their styles are great, running, fitness, trekking, everything. Go have a look, or check out our full Tall Men Shoes List. Check out Lee’s selection of clothes for the Tall. Their jeans can often be ordered in size 36 and 38, so if you like the style, then here’s where to find a nice pair of blue jeans. See full Jeans for Tall Men List. These Australian guys make tall tees in awesome styles. Not just boring longer t-shirts, but some that actually have a hint of design thought into them. The brand is brand new, so the selection is limited as it is, but they have told us that many new products are in the pipeline such as jackets, shirts and hoodies. Ships to: Australia, Denmark, UK, USA, Switzerland, Netherlands, Malaysia, Japan, France , Canada, Ireland. I’m really happy to see that the more mainstream brands are pursuing tall clothing too. H&M calls it Long Fit, and it is mainly t-shirts, shirts, hoodies and tanktops with extra torso length. I recommend you check it out! XLT Clothing is an American webshop where you can buy clothes in the much desired Xtra Large Tall size. However, the selection isn’t great – limited to some shirts, polos and socks. Six8 Clothing Co. Coupon Code: ‘tallsome’ (10% off).The name refers to the height of their customers – 6 foot 8 inches. These guys strive to deliver clothing in tall-sizes, but not only that. They also try to adjust the detailing like zippers and pockets to accommodate the needs of tall people with bigger hands etc. This is the real deal – a company truly devoted to making tall clothing. Tallboys Apparel Coupon Code: ‘TALLSOME’ (20% off). Here we have a Canadian tall brand that targets tall and slim men specifically. You are offered a nice selection of round and v-necks in black, white and grey, AND now you can also get some really cool and casual Button-Down Shirts. Clothing for the tall and thin man – that’s what we need! A very limited selection so far, but maybe supporting them will make them grow. My favorite pick is the chinos in length 36″ and 38″ – something that’s normally pretty hard to find. High-end Swedish shirts with great fit for tall men. High quality formal shirts that are among the best off-the rack shirts around for tall people – excellent fit (3 fits to choose from) and very high-end quality. They have a decent selection of extra tall men stuff but especially shirts. I wear a 38-39 sleeve and get their JFerrar slim fit. Nice contemporary patters too. 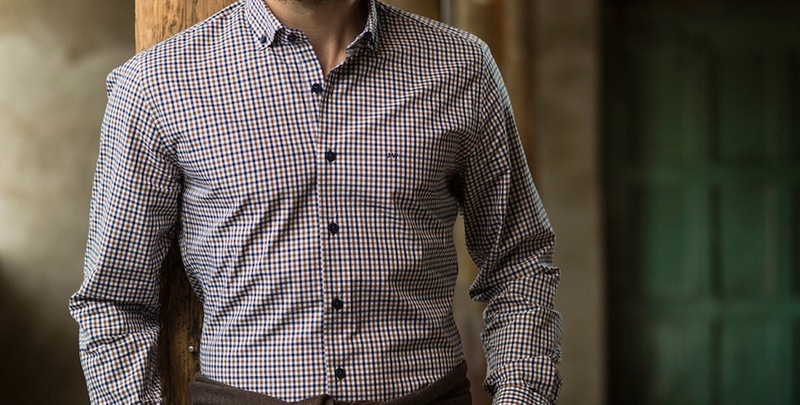 Some of their other brand shirts – Stafford full cut but when I get them I take them to my tailor I have been using for over 10 years and she makes them look slim and fitted. A tall guy needs to understand they MUST HAVE a good tailor. Most stuff off the rack will never fit. They can make you look way better even in your existing clothes. I took my entire wardrobe of baggy everything and had it fitted, including coats to her and I get compliments to this day about how I look. Another thing – real tall guys need to stop wearing long rise pants or jeans. I buy suit separates. I wear a 40 or 42 extra long jack because I need the sleeve length. I wear a 33 regular slim fit pant NOT 33 long. Long rise pants mean the crotch is sagging or too long. In jeans I stick to low rise on my hips with a of no longer than 8-10 inches. Owned by same company that owns Menswearhouse. A bit more conservative but I can get more suit separates. Finding clothing as a tall man can be difficult. Big & Tall brands fit some tall guys, but for tall and skinny guys like me, I need more fitted and slim clothing. Therefore, I have gathered a bunch of tall shops that cater for tall and slim men. If you are looking for tall tees with longer torso, casual and dress shirts with long sleeves, jeans with longer inseam lengths or any other piece of clothing for tall guys, then you have come to right place. All Tall Shops above are selected brands that cater for tall and slim guys – looking for long jeans with extra inseam length, tall tees with longer torso and shirts for tall men with longer sleeves etc. The tall shops list is prioritized so my favorites tall brands are featured with pictures at the top. I have tried most of the featured tall shops myself and use my own tall body (I am 2,o4 m or 6’8″) as a point of departure and review all the tall people’s clothing with myself as reference. More in-depth reviews of the individual tall brands is found in Tallsome’s blog posts, where I take a look at specific clothing brands for tall guys. If you want my insights and opinion on a particular tall shop, then I recommend reading along in the blog posts listed below. A quick guide on how to find clothes for tall guys like me. I talk about how to measure yourself in order to find your exact body measurements. These are use to find the right tall shop for you that offers tall clothing with the right fit for your bodytype and dimensions. Next, I suggest using tailor-made brands that don’t have to be very expensive – like Sonofatailor.com. Lastly, I give you some hints on my current favorite tall shops. A very popular guide on tall tees – a kind of face-off between 3 favorited tall tees from ASOS, Plus2 Clothing and Hanes. If you like tall tees like me – t-shirts with longer torsos, then this guy is for you. I can reveal that the winner is the ASOS Super Longline tall tee. The price is low and the quality is pretty good. The ASOS tee is fitted without being tight – or baggy as normal t-shirts are, when you go for XL or more to compensate for torso length. American Tall is an american brand catering specifically for tall men. They offer a growing range of shirts fitted to tall guys with long sleeves and bodies, jeans with longer inseams and really cool casual fitted blazers – also with a focus on long sleeves and longer torso. I talk to Jake from American Tall and ask him how American Tall is different from other tall brands. American Tall visited my in Copenhagen to talk about my life here as well as how Tallsome started and much more. Soon, a video made by American Tall will be featured on their website, and I’ll make sure to share it here on Tallsome as well. Jeans for a +2 meter guy is hard to come by, but 2tall.com has made my new favorite jeans in 38″ inseam. If you are looking for slim-fit and long jeans, then you should read along as I review these skinny jeans from England. The price is also pretty good, and the fit is great for European tall guys like myself, as we often prefer the tighter fit. An extensive guide on tall men’s clothing can be found on Reddit, and I have review the guide here on Tallsome. I comment on the point being made in the Reddit post, and urge you to go have a look there as a supplement to my Tall Shop List here on Tallsome. I love the concept of tailor-made t-shirts from sonofatailor.com. Tell them your body measurements or describe your proportions to the tailor calling you, and they produce a unique tailor-made t-shirt for you. After reviewing the first tall tee, I had made, I got a second one that was corrected and optimized to fit my tall body perfectly (at no extra cost). I recommend trying a t-shirt from sonofatailor as it has become my favorite tall tee to date. If you aren’t ready for tailor-made, then a great off the shelf tall tee is the one from Beanstalk. The quality is great and fit me really well in XL. Sifr is behind this tall tee, and they really know what they are doing in terms of fabric quality and fit. This is a recommendation of So Long Sven – a Swedish tall brand that makes the coolest shirts for tall guys. A fitted, fresh shirt with long sleeves and a non-tuck torso for a casual look. These shirts are perfect for tall guys in Scandinavia and European who aren’t super fond of the baggy styles of many american tall shops. For the tall man living in the United Kingdom, things are definitely going in the right direction. More and more tall men are starting webshops themselves as a response to the frustration around not being able to fit their local selection of clothing. If you live in the UK, I can recommend taking a look at 2tall.com. My favorite tall jeans are from there, and I actually got myself 2 pairs of the same Ed Baxter Tall Jeans style, because it is pretty much the only style fitting my long legs. The long jeans I have are 38″ inseam, which is longer than what most normal shops cater for. Another great option for you if you are looking for tall men’s clothes around UK is ASOS. Asos is going all in on their Asos Tall range of clothing for tall guys. I actually went over there, as Asos invited me, to try on a few styles and get a bunch of their clothes in longer legs with me home. Even though the style of their Asos Tall range can be a little far out, I really like the fact that tall shops are daring to take a change and challenge the dull look of most tall men’s clothing – sorry to say. Most of the above brands selling tall men’s clothing will offer you the option of shipping to UK. If you’re a tall order looking for clothes, and you think that the price becomes too high with the shipping form US or other countries, then I recommend 2tall, Asos Tall, Bonobo and TallSlimTees. Can A Spot On Tallsome’s Tall Men’s Clothing List Be Bought? I have never seen so many shoes in my size (50 – 51) at one place before. Why no mention of 2tall.com ? In the UK they have by far the best range of stuff for tall, rather than big and tall guys. I buy all my jeans at http://www.shop.pme-legend.com. They go to 38 length, which is awesome. I recently bought a pair of sweatpants on http://www.highleytall.com/ for a Pantzeri in 40 inch length. It is amazingly comfortable to wear sweatpants in the right size. Im having a lot of trouble finding shirts with long sleeves, but i am going to check out all of the above stores! Thanks for commenting. I’m having trouble finding jeans myself, but I have also found a couple of stores that hold 36″, 38″ and 40″ – but they are seldom! 🙂 I’ll definately look into highleytall.com – have you gotten other things from there? Yes, I also ordered a short sleeve shirt. It was tall enough, but still a bit wide. Williamsburg Garment Company has a nice selection of tall mens jeans in 38″ inseams. thanks Maurice, these are my fav new pants! Yeah, Guus – they have a really great selection! Which kind did you get and how is the quality/price on your pants? Good luch with this site! Thanks 🙂 Hope you’ve found some great clothing for tall guys. Feel free to share your favorite tall shops in here, so the list can be continuously updated. Know anywhere that will ship to Italy, and has relatively cheap casual shirts? Also ‘So Long Sven’ make longer tanktops, however not AS long as Asos. Depends on what you want and how tall you are. Rued, check out weargustin.com; I have several pairs of their jeans which come with a 36″ inseam, and a few of their Medium-Tall shirts which fit great. The downside is that they’re a crowdfunded enterprise so you have to wait a couple of months to get your orders, but I’ve been thoroughly impressed with how well everything is constructed. Super cool list! Very helpfull. Hello, did someone know where I can find some tall Poloshirts? I`m looking for kind of “no name” shirts, just blank, in grey, white, etc. Cutterbuck looks good, but are the polos also for the skinny and tall, like me? 🙂 Or are they mainly catering for the Big & Tall segment, as their menu says? I’d love to hear your experiences with the brand. Maurice, this week I received a pair of xtra tall jeans from Williamsburg Garment Company. they are awesome! thanks for the tip. thanks for keeping this site up. Its making my life a lot easier and my wardrobe more divers! One great resource for suits and tuxedos is suitopia.com. I am 6’7″ and got a nice tux for $230. All you do is send in measurements and they make a custom suit. Great concept and resource. how about tall men’s sleepwear? flannel or broadcloth, thermal underwear… impossible to find. Hey Rued, you’ve got to include TallSlim Tees (https://www.tallslimtees.com) in the list! In fact, I’m happy to send you one to try if you would like to review it. Just let me know, thanks!! G Star jeans offer sizes up to 36″ leg length. And all my shoes come from oddball.com – best collection of size 15+ I’ve found. Wow, Oddball looks great – and what a weird name 🙂 I am actually working on an article on tall men’s shoes, so your link is perfectly timed – thank you! G star is great in the sense that they have 36″ inseam, true – actually more and more mainstream brands offer this longer length – at least online. Great website! Thanx for sharing! G-star- Check it out! Jeans with 38 inseam!! Any Ideas where I can shop that ships to Australia , I’m 6’7 and 75kg so I struggle to find cloths that fit me ? Shoes in sizes 47-52 – with an EXCELLENT feature, where you can measure your feet and put in their length in milimeters. The site then returns a list of shoes that will fit your feet. I have bought around 10 pair of shoes/boots from this company over the last 3 years (Pretty much all my footwear. ), and will continue to do so for a long time. I know that TEAL provides unfinished 40″ inseam (http://tealapparel.com/store/all-american-chinos-navy-slim-fit.html). I found your site while looking for tall t-shirts for my husband. He’s had such a hard time finding shirts that fit that he tends to hold on to his favorite tees (and they’re crazy holey)! I just wanted to say thanks for the list! I took your advice and ordered a few Hanes Beefy Tall Tees. As for polo shirts, you should really look into Cutter & Buck – excellent quality and washes so, so well! I’ve been looking into the Cutter & Buck and it looks great. However, I am mainly trying to filter out the clothes for tall and slim men – more than the Big & Tall clothing, which can easily be found around the internet. Are their apparel also slim fit – in your experience? Jeg er 1.98, vejer 100 kg grundet styrketræning og ikke buffet, samt meget lange arme. Du kan evt. tilføje https://www.asket.com/ til din liste – Jeg har netop købt 2 skjorter og de passer fint. Længden er rigtig fin, men de er dog lidt tætte over brystet, hvilket jeg ikke tror vil være et generelt problem. Har du nogle forslag til jakkesæt, fra danske sider eller butikker? (Troelstrup er prøvet, men jeg vil gerne have alternativer). – og igen: tak for en god side med nyttige links. 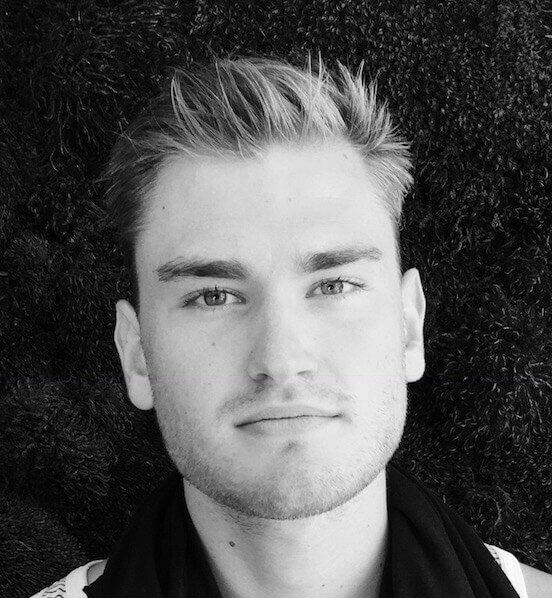 For suits in Copenhagen/Denmark, I recommend SuitSupply, MOND or Suitopia. Help, please! Anyone! My 14 year old son is 29-30″ waist and needs a 16″ inseam for shorts. He just needs some casual clothes, nothing fancy. I can’t anything anywhere. I tried looking at all the stores listed here, but the closest thing I’ve found was 2″ too big around the waist, 1″ too short in length and were $50 for one stinkin’ pair of shorts! I’m going to have to become a seamstress, I just know it. You might have to embrace becoming a seamstress. My son has the same issue with shorts. I buy cargo pants with a 28″ waist and whatever inseam is available and just cut them off and hem them. Even in larger waist sizes, the shorts are still too short to make taking the waist in worthwhile. This way, he gets a much better fit. Finding 28w/36l pants and jeans is a much tougher matter. Just found these! 28 and 29 inch waist with 14″ inseam! any recommendations on where to find men’s comfy athletic pants in 30×36? Good list….don’t forget to add Beanstalk Apparel. Beanstalk is now on the list 🙂 Don’t know why you weren’t included, as I’ve written a good review of your tall tees already. Yeah, there are lots of choices, and it keeps getting better. Hi, wondering if you can help after reading this. I’ve just lost 5 stone (1/2 left to go) and as a result need to restock my wardrobe. However, whilst checking the links out, to do this I’m going to either have to win the lottery or channel the spirit of Ronnie Biggs. Do you know of any UK based retailers other than next, m&s and debenhams that offer tall ranges that won’t require grand larceny or bankruptcy as need a lot. I like to use Giantshoes.dk, Allsize.dk, highleytall.com and Dressmann XL. Thanks for the tips 🙂 I’ll check them out! The more I search the more I find, great to see this post. To follow the trend, and for Michael, I’ve just started a men’s basic line which is serving New Zealand and Australian customers. I’m 202cm and was struggling down here to find clothes that fit nicely. Have launched some tall tees to start and currently working with our factory to create some tall casual shirts. Check them out and would love to hear feedback, http://www.shaw.clothing. Raul if you do another tall clothing list I’d love to be involved. Wow, this is a great website for tall people. I have been struggling to find some slim fit jeans that are 36″ length lately and I just hit the jackpot with this website. Thank you for taking the time to make this, you rock! Thank you for the comment – warms my heart as I have put a lot of hours into gathering and quality checking these sites for tall guys 🙂 I too have had trouble finding pants and jeans in 36″ and 38″ in length, but now I own two pairs of 2tall’s slimfit Ed Baxters in 38″, and they are great 🙂 Also american tall have some very nice jeans in a more regular fit, if the slimfit isn’t for you. My pleasure – make sure to check out Nordstrom.com; they have a lot of 36″ pants and jeans in various waist sizes. I’m 6’8″ and love my Plus 2 Clothing grey sweatshirt. Very long torso, little shorter sleeves. Otherwise, NAVAS has a great black sweatshirt with front zipper. Asos Super Longline is an option – however the sleeves aren’t longer than normal. Does anyone know where to buy winter jackets? Parkas and ski jackets for cold outdoor activities. I am 6’6″ 190lbs and I can’t find any brands that make jackets in this size. Columbia has tall sizes for ski jackets-I’m almost exactly your size and Large Tall is a great fit. I love mine. Having trouble myself finding a good casual jacket for off the slopes. Now if only I knew which offer free return shipping (like nordstroms). Would have been nice to have it sort by Country too.. since oftentimes it’s much more convenient to order within ones’ own country. Does anyone know where to buy underwear for extremely tall guys? I am 7’2″ the rise is just too short. Has anyone had any luck with joggers (khaki/chino type, not fleece-type material)? I need 38″ inseams preferably in the US. I think I’ve tried every website on this page and comments with no luck. I can’t be the only person with a tall teenager who wants them! Help!! This is another good development from ASOS. Thet now have a dedicated tall page. looking for long tracksuit pants – not the fleecy type and went on to your adidas link but they said it was a 70cm leg – i’m looking for 35 or 36 inch for my son – any suggestions? Great, thanks for the tip 🙂 Do you like the fit and style as well? Abercrombie & Fitch and Hollister Co. offer denim and pants in 36″ length online and in stores when ordered at checkout. There 36″ inch length is awesome too because it runs longer so it gives you extra security. Many different fits, styles, washes, finishes, materials, and variations to choose from! The waist sizes range from 30-38 in these long lengths. I wear a 32×36 and they are the best jeans in the world. Comfortable, durable, and classic styles that will last for years whether you are hanging out or going out. This is all I wear. Where can I get tall sized cashmere sweaters?? Long arms, slim torso? Any help is appreciated. lands end also has 36″ inseam pants..
Long sleeve dress shirts are a problem. He wears a 39 inch sleeve. Haven’t managed to find anything longer than 37″ for him. I would look into the ‘made to measure’ solutions – either from High & Mighty (UK) or TailorStore (Sweden) depending on where you live. I had a tailored shirt from TailorStore and it blew my mind! Really great fit and quality. Thank you for the list. I am 198cm (in france) and shopping is hard for casual clothes. (36″ inseam jeans are OK but for shirt/pulls, this is harder). I am also 47 (13US) for shoes. 47 doesn’t seems so big but it is actually very hard too (most shops stop at 46). Add to that the fact i have large(width) feets. Almost impossible to find shoes i can try (most shoes are too narrow for me). Wow! Not sure what to think! All you guys saying you are 6’8″ and only wear 36″ inseam…my grandson is 18, 6’6″ and needs a 40″ inseam. Can anyone tell me where in the US I can find jeans/pants in 32Wx40″L??? ?…that won’t put this grandma in the poorhouse??? I’m on disability so my finances are very limited. He needs all new clothes for school. He has autism so he’s very particular about things. He likes the tees and sweatshirts at ASOS, but the jeans all have rips and they aren’t allowed at school. I’m having a difficult time finding swim trunks or board shorts for my 6’8 husband. He’d like them to about his knees which I have yet to find anything with an inseam long enough. Any suggestions? Thank you for all the great links! I’m 6’8″ too. I got great swim shorts in the Philippines. I am 18, live in Canada and I am 6 7. There aren’t that many sites that sell 38 inseam chinos and jeans in a slim fit. I found some on 2tall.com which are great and American Tall but that’s about it. For the most part the rest are between 34 and some in 36. Have I missed something? I want trousers that are NOT jeans, NOT business suit, NOT tracksuit bottoms.just 36″ inseam and 40″ waist. But not just elongated from 30″ slim guys. I need to get my feet through the legs and my thighs. My suits are now almost 20 years old. The trousers are worn. The jackets like new. I’ve seen some very thin jeans, but 4 inches too short. Shopping in shops sees me getting a shopping rage as I collect shops where nothing fits, except blueish jeans or grey tracksuit bottoms. In Germany they have those impossible sizes like 56. But that’s not 56 inches nor 56 centimeter, not waist size nor inseam length. For tall people you’d have to double the number and even then it’s not a measurement. In America and Asia they use XL, XXL, 2XL…6XL. But L never means long. They are all too short. An XL shirt from Indonesia could be a similar size as an XXL shirt made in China. An XXL shirt from Canada might fit comfortably while an XXXL short from China leaves wrist and back bare, while leaving enough space around the middke for someone else. I feel your pain; the different measurements standards doesn’t make it easier to shop for tall men’s clothing online. No 36 inch trousers come to mind immediately, but I would probably go for a local tailor or something like that, if you want to choose both size, material and price. Largest Hollister trousers are 38W x 34L. Any suggestions for my son, is 15 and 6’4″ and a 31″ waist, 175 pounds, we live in the USA and he needs athletic pants. Where can athletic pants be found? I pleased to find this sight and the options for the skinny and tall. My son is 16 and 6′ 6″ and size 16 shoe and his 38 inseams are starting to look short. I have had trouble finding that size. Now I will be looking for a 30 X 40 and hope this sight will help. If you come across any PJ’s bottoms for that tall, it would make his day. And long shorts he loves basketball shorts, but they are to short for his waist size. You can get tall sizes at Eddie Bauer (Canadian and US web sites). Nice Khakis and Chinos (with a made to order inseam up to 37′ in some cases) amongst other things. I love the fact this site exists – was filled with hope. – Tried to find sleeve lengths… a lot of sites don’t mention what length sleeves are. Any thoughts on who does cotton long tees that give sleeve lengths? – When I link to other sites with tall sizes, I quickly get routed out of the tall section and find myself wading through standards sizes again. Hmmm. – Most of the world is metric, yet almost all size mentioned are in inches. It would be good to encourage all sites to have clear metric toggle for the rest of the world that isn’t actually america. Thanks for the feedback – very useful, and I agree; metric sizes would be nice, and sleeve lengths are often left out in the size charts. If you have any more feedback on how I can improve the listings here on Tallsome, feel free to reach out again. Thanks. Can I suggest American Eagle for tops and bottoms? I’m 200cm and 85kg (6’6″ and about 185lb) with and 36″ waist and 36/38 inseam. AE had some excellent long-sleeve shirts on sale in a L Long which fit me perfectly. I got some 36″inseam track pants though some were actually longer than others; they have long fittings in many items and offer free international shipping for orders over $100. Thanks Justin – that’s a great tip. I will definitely add American Eagle to the list of tall shops. I barely even count as tall — only 186cm — but I have a very narrow frame. My chest is 90cm. I have no problem buying jeans but shirts are an absolute disaster. Size S is basically the right width, but FAR too short. The only shirts that I have ever had which are the right size are from ASOS, plus I have some formal shirts which I can only wear to events like weddings. But ASOS is mostly for 20 yo men, and is fairly low-end . I’m looking for good quality smart casual clothes. On your list, the only shops which seem to have this are Nordstrom and J Crew. But Nordstrom’s tall clothes are all width M or wider (more than 20 cm too wide!! 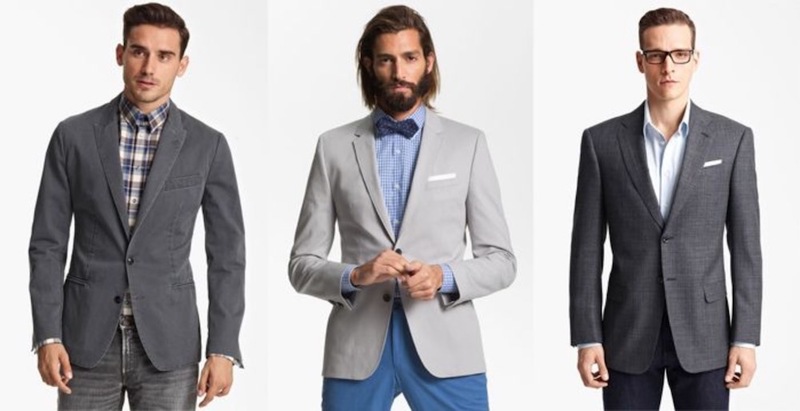 ), and I could not find anything for slim men on J Crew’s site. I’m in Europe so I can’t use the US-only sites. Is ASOS really the only shop in the world which has any clothes in my size? Thank you so much Rued ., until finding this site I looked like a bag tied in the middle , Love your blogs and suggestions. Now I look like the “ tallsome “ guy I always should have ? Just FYI – Stenstrom Sweden has some great high end apparel but they unfortunately do not ship to the US as of Dec. 2018.